The folks at the carrier of magenta (T-Mobile if you haven’t been keeping up) have announced two new tablets. One kind of doesn’t count as a huge announcement in our books. It’s the Samsung Galaxy Tab 10.1 with 4G radios inside. While T-Mobile initially confirmed they’d be carrying the tablet, we didn’t know if it’d be WiFi-only or with data radios inside. Now we know. Look forward to HSPA+ connectivity alongside a 10.1 inch display, a 1GHz dual-core Tegra 2 processor, 1GB of RAM, Android 3.2 Honeycomb and more. The 7-inch T-Mobile Springboard will excite quite a bit of you. T-Mobile’s calling this one “ultra-portable” as the Huawei-manufactured tablet purports that aforementioned 7 inch display, a 1.2GHz dual-core processor (no mention on the make and model), a 5 megapixel rear camera that is capable of shooting 1080p HD video, a 1.3 megapixel front-facing camera and a standard SD card slot with support for 32GB cards. 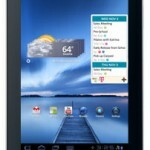 Both tablets have been given an availability window of “in time for the holiday season” with nary a price to mention. Read on for full press details. BELLEVUE, Wash. -- Oct. 10, 2011 -- T-Mobile USA, Inc. today unveiled two new 4G* Android™ 3.2 (Honeycomb) tablets, enhancing its growing tablet business and portfolio of high-speed mobile broadband devices. The T-Mobile® SpringBoard™ with Google™ and Samsung Galaxy Tab™ 10.1 will enable customers to enjoy their home Web and entertainment experiences virtually anywhere. "Our customers expect the ability to access and share content on the go at 4G speeds, so weve created a 4G tablet portfolio of 7-, 9- and 10-inch tablets with their busy, highly mobile lives in mind," said Jeremy Korst, vice president of mobile broadband and emerging devices, T-Mobile USA. 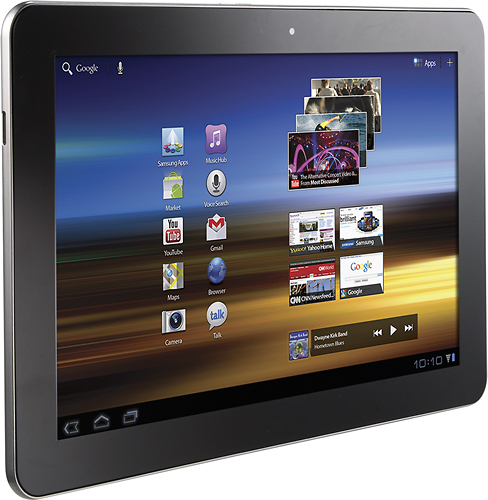 "The T-Mobile SpringBoard with Google and Samsung Galaxy Tab 10.1 are the perfect evolution of T-Mobiles tablet portfolio, providing consumers with the right choice of tablet to easily look up a recipe at the grocery store, update social media sites on the bus or stream movies and music in the back seat of the car." The 4G-enabled T-Mobile SpringBoard is one of T-Mobiles most affordable tablets, offering a premium mobile entertainment and rich Web experience that wont break the bank. Featuring a stunning 7-inch HD multi-touch display, the ultra-portable T-Mobile SpringBoard can fit comfortably into a coat pocket, briefcase or purse, making it easy to carry with you while running errands, hopping on an airplane or waiting at the doctors office. Manufactured by Huawei, the T-Mobile SpringBoard is powered by a 1.2 GHz dual-core mobile processor and offers a variety of preloaded entertainment applications, including access to thousands of movies and TV shows via BLOCKBUSTER on Demand®, Netflix® and T-Mobile TV. The SpringBoard also offers high-speed Web browsing with support for Adobe® Flash® Player, as well as access to services and applications including Blio® eReader, MobileLife® Family Organizer powered by Cozi, Slacker Radio and TeleNav GPS Navigator™, a personal GPS navigation and local search application that provides turn-by-turn voice and on-screen driving directions. The T-Mobile SpringBoard is also the perfect device for capturing and sharing moments with friends and family while on the go. Equipped with a 5 megapixel rear-facing camera and video recorder with 720p for HD video capture, as well as a 1.3 megapixel front-facing camera, customers can easily capture images and video and share with loved ones. In addition, with an SD card slot that accommodates up to 32GB of expandable memory, its easy to save movies, music, photos, documents and more so customers can have easy access to everything they need. 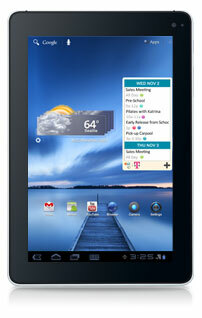 T-Mobile also unveiled the ultra-thin, 4G-capable Samsung Galaxy Tab 10.1. Weighing just 1.24 pounds and featuring a spectacular 10.1-inch HD touchscreen display for a widescreen viewing experience, the Samsung Galaxy Tab 10.1 is one of the thinnest and lightest 10-inch tablets on the market. T-Mobiles Samsung Galaxy Tab 10.1 comes equipped with preinstalled content and applications, including T-Mobile TV, Qello®, Samsung Media Hub, Asphalt 6: Adrenaline HD demo, SIM City Deluxe demo, Blio® eReader and Zinio®. *T-Mobiles HSPA+ 4G network not available everywhere. See coverage details at http://www.t-mobile.com. Based in Bellevue, Wash., T-Mobile USA, Inc. is the U.S. wireless operation of Deutsche Telekom AG. By the end of the second quarter of 2011, approximately 128 million mobile customers were served by the mobile communication segments of the Deutsche Telekom group -- 33.6 million by T-Mobile USA -- all via a common technology platform based on GSM and UMTS and additionally HSPA+ 21/HSPA+ 42. T-Mobile USAs wireless products and services help empower people to connect to those who matter most. Multiple independent research studies continue to rank T-Mobile USA among the highest in numerous regions throughout the U.S. in wireless customer care and call quality. For more information, please visit http://www.T-Mobile.com. T-Mobile is a federally registered trademark of Deutsche Telekom AG. For further information on Deutsche Telekom, please visit www.telekom.de/investor-relations. For more information about T-Mobiles 4G products, please visit http://www.t-mobile.com. This press release contains forward-looking statements that reflect the current views of Deutsche Telekom management with respect to future events. These forward-looking statements may include statements with regard to the expected development of revenue, earnings, profits from operations, depreciation and amortization, cash flows and personnel-related measures. You should consider them with caution. Such statements are subject to risks and uncertainties, most of which are difficult to predict and are generally beyond Deutsche Telekoms control. Among the factors that might influence our ability to achieve our objectives are the progress of our workforce reduction initiative and other cost-saving measures, and the impact of other significant strategic, labour or business initiatives, including acquisitions, dispositions and business combinations, and our network upgrade and expansion initiatives. In addition, stronger than expected competition, technological change, legal proceedings and regulatory developments, among other factors, may have a material adverse effect on our costs and revenue development. Further, the economic downturn in our markets, and changes in interest and currency exchange rates, may also have an impact on our business development and the availability of financing on favourable conditions. Changes to our expectations concerning future cash flows may lead to impairment write downs of assets carried at historical cost, which may materially affect our results at the group and operating segment levels. If these or other risks and uncertainties materialize, or if the assumptions underlying any of these statements prove incorrect, our actual performance may materially differ from the performance expressed or implied by forward-looking statements. We can offer no assurance that our estimates or expectations will be achieved. Without prejudice to existing obligations under capital market law, we do not assume any obligation to update forward-looking statements to take new information or future events into account or otherwise.